Today I went to the open house at Loch Aerie. 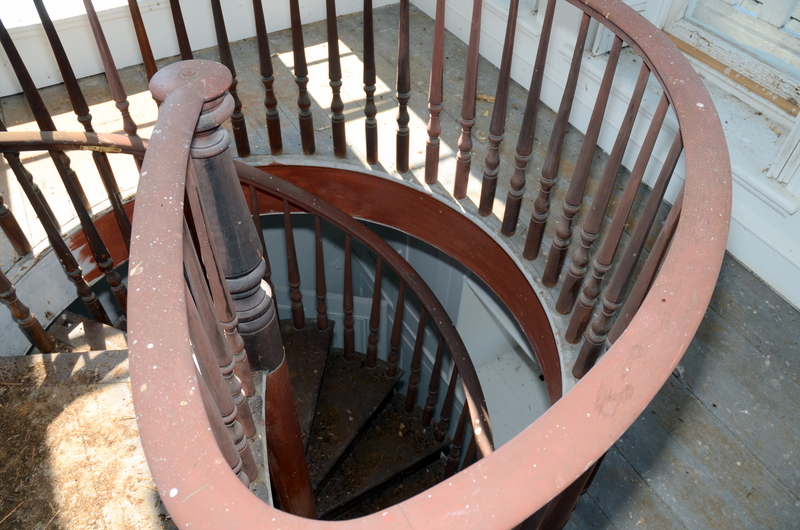 I went all the way up to the top of the house to the cupola and the widow’s walk, and down to the somewhat creepy root cellar. It is truly an amazing house and considering all the abuse it is taken over the past few decades, it is in remarkably decent shape. I took hundreds of photos and also talked to people going through. 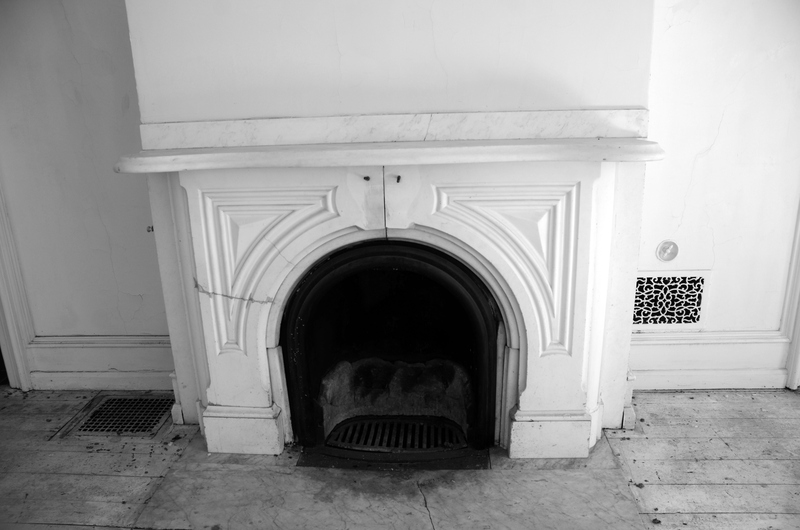 Some were local people who read this blog and had seen me discuss the mansion, also a lot of regular people who like myself just always wanted to see the inside, and quite a few people that actually seemed interested in preserving the mansion. There were also developers and developer representatives and lots and lots of contractors. I met a woman from far away with a big family that includes a lot of adopted children and grandchildren who is looking for a place to call home. I also met a guy who grew up near the mansion and told me stories of when he and his siblings were little. 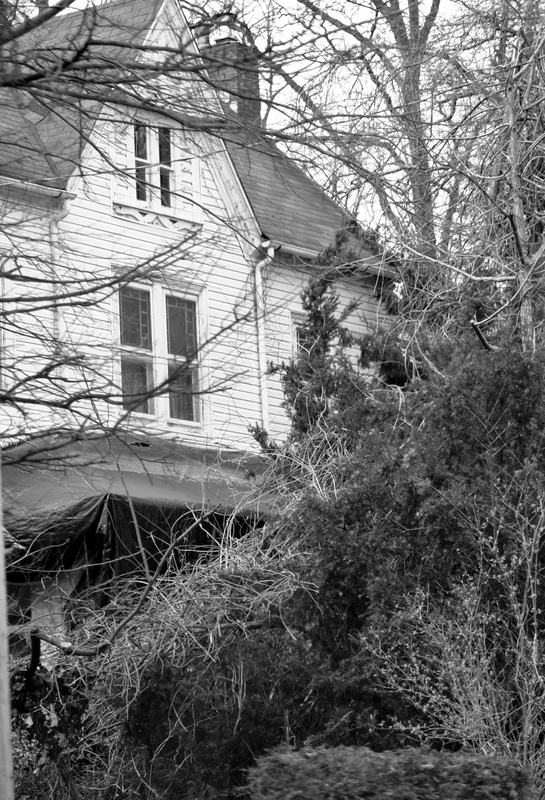 He told me how they saw the bikers drive up to the house when they were squatting in the mansion in the 1970s I think it was. 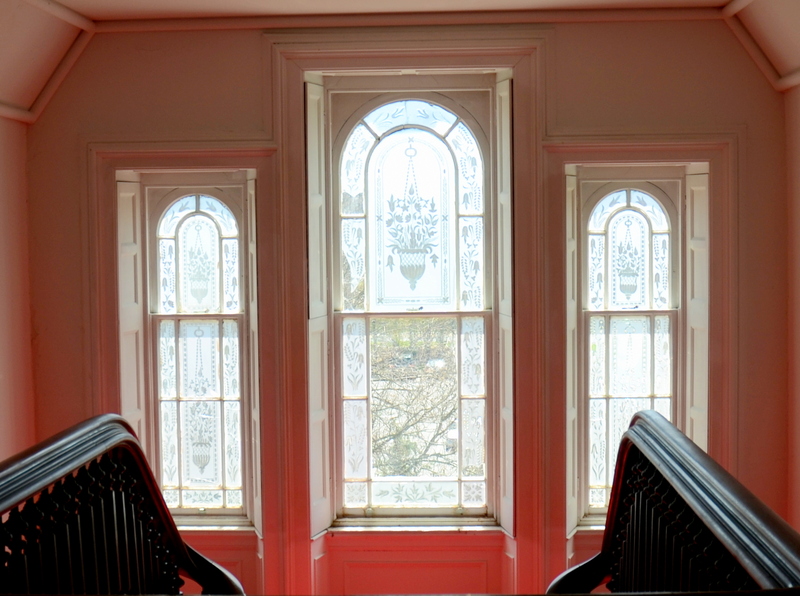 He also said that the bikers would ride their motorcycles up the front steps and up the staircase. And that kind of makes sense because there are marks and some of the floors upstairs that look like tires. He also told me of when the bikers had left and the kids in East Whiteland used to use the pool tables and pinball machines that were on the first floor. As a young boy my father, now deceased, worked making sandwiches at the Lockwood Mansion. Two elderly sisters employed my father. One of their relatives, Leaugeay, helped my father make sandwiches which were taken to the train station nearby for the soldiers. As the years gone by, my father married and named my sister, Leaugeay as a namesake of a family who helped dad. Growing up on Morstein as a young girl our large clan passed by the mansion many a Sunday on our visits to other family members. 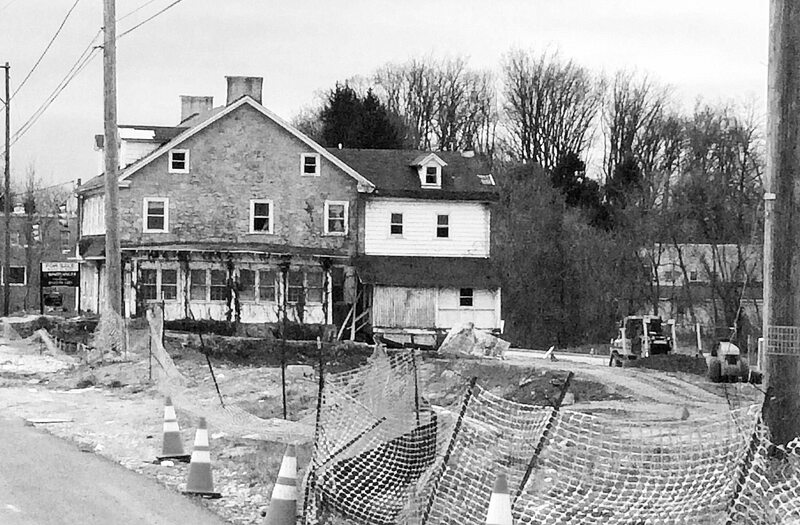 Really hate seeing another landmark in Chester County being replaced by commercial buildings. WHAT is going to be left for OUR GRANDCHILDREN to visualize HISTORICAL LANDMARKS……..What a shame that opportunity and money pass over our History. 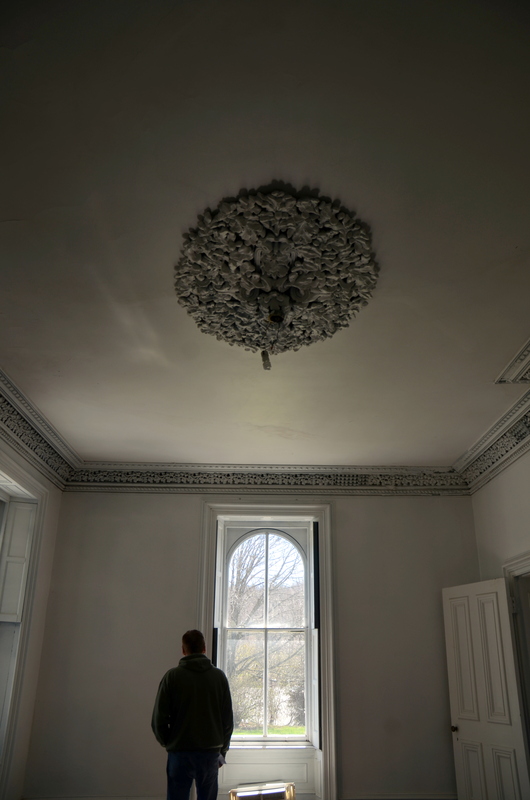 I was amazed at how few people actually knew any of the history of the house they were just drawn to it. It really is a landmark. And an emotional pull back to the area for others. Someone from East Whiteland Historical Commission was there. A woman whose name escapes me. I don’t think she was particularly thrilled to meet her friendly neighborhood Chester County blogger, and I’m sorry for that but I am not sorry for my opinions necessarily. She said they were meeting next week, but to what end? Do they have a preservation buyer with deep pockets to bid on Loch Aerie come April 21st? When I asked her about Linden Hall, she assured me it would be preserved but that old porches not historically authentic would be torn off. I told her Linden Hall already looked like demolition by neglect, but she assured me I am wrong so we shall see. I hope I am wrong. If this beloved mansion Loch Aerie can find the right buyer future generations will be talking about her in years to come. What a perfect fit for a historic architect: designing the building for the Historical Society of Pennsylvania at 1300 Locust St. in Philadelphia in 1902. Known by many as the Quaker architect, Addison Hutton was a popular and prolific professional who designed palaces on the Main Line and in surrounding communities, and grand college buildings on campuses including Bryn Mawr, Haverford and Swarthmore colleges and Lehigh University, as well as adding his talents to the designs of courthouses, museums, libraries and religious institutions. Many of his most famous Main Line mansions have served double purposes. The Waverly Heights home of a railroad executive is now an upscale retirement community in Gladwyne. Ballytore in Wynnewood first served as a home to the co-founder of the Strawbridge & Clothier department store, then lived its second life as the home of a private school and is now in its third life as an Armenian church. Hutton also used his talents for designing religious sites. 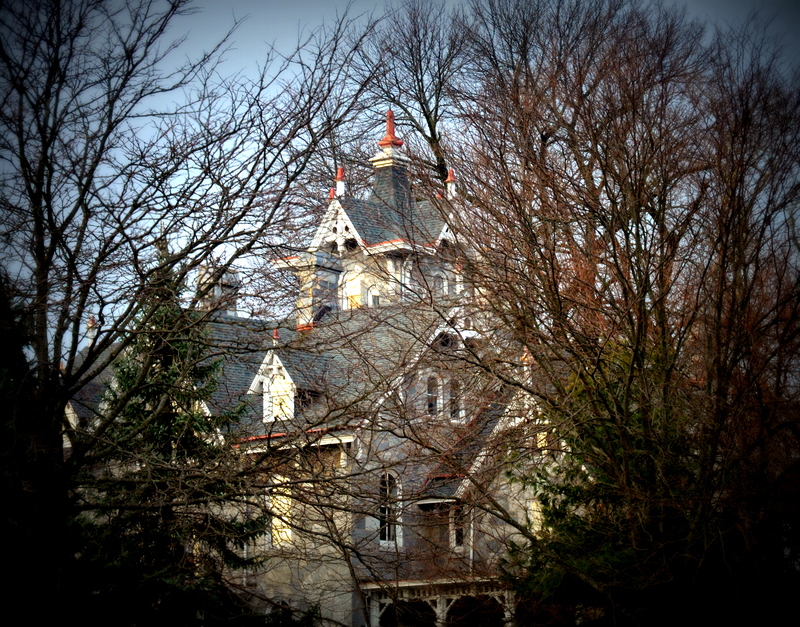 In 1872 he designed the rectory for the Church of the Redeemer on Pennswood Road in Bryn Mawr. The original portion of St. Charles Borromeo Seminary in Wynnewood was built in 1871 with Hutton and fellow architect Samuel Sloan designing the building where the preparatory college and theology divisions were joined in September 1871…. The Main Line Times article is quite long and well worth reading in it’s entirety. 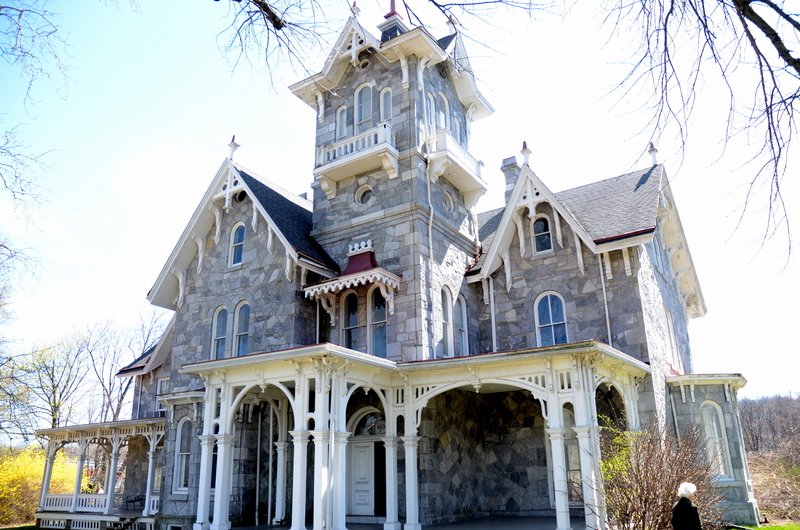 BRYN MAWR — If you renovate it, we can use it. That’s the word from the Shipley School, which recently relented on its controversial plan to demolish a 19th-century building on its campus after a prolonged battle with local historic preservationists. Yesterday, the school welcomed several architectural firms into the aging Beechwood House and asked them to pitch their best ideas for how to renovate its rooms for school use. However, the school did not ask the architects to pitch their bills for the work to Shipley’s accountants. Someone else will be paying for the renovations. 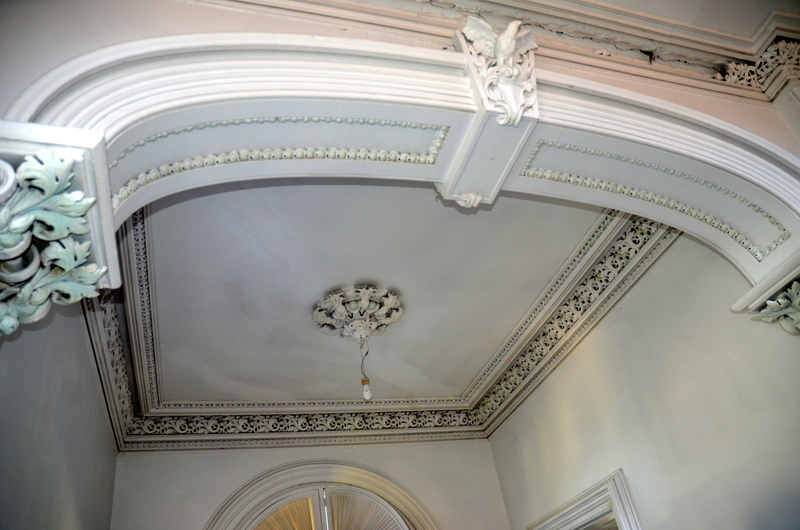 As agreed in negotiations with the school, a group of Shipley alumni, preservationists and others who want to save the building have the job of raising the necessary money – possibly as much as $1 million – by Jan. 1, 2001. If they fail, Shipley reserves the right to tear Beechwood down. But if the group can leap that hurdle, school officials are ready to make good use of the old building. 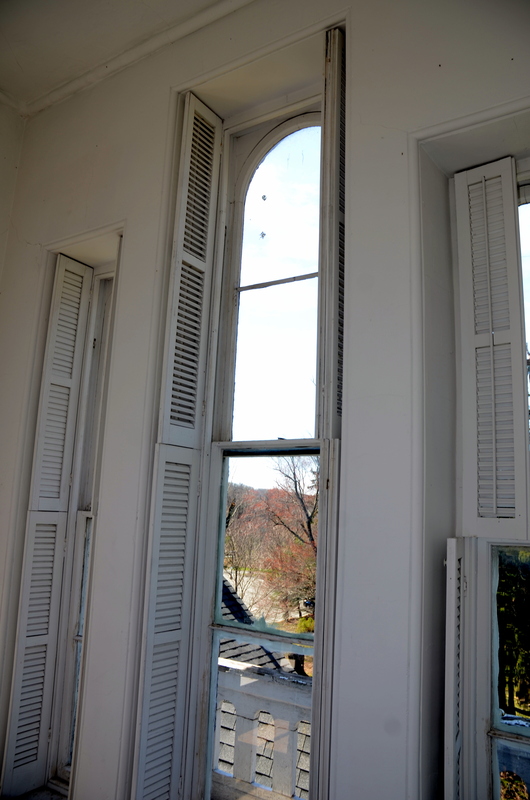 Frens and Frens were the Philadelphia architecture firm which did the restoration of Beechwood. They won numerous awards as a result. Another Addison Hutton home, also in Bryn Mawr on the corner of Montgomery Avenue and Bryn Mawr Avenue is another more recent and successful adaptive reuse. 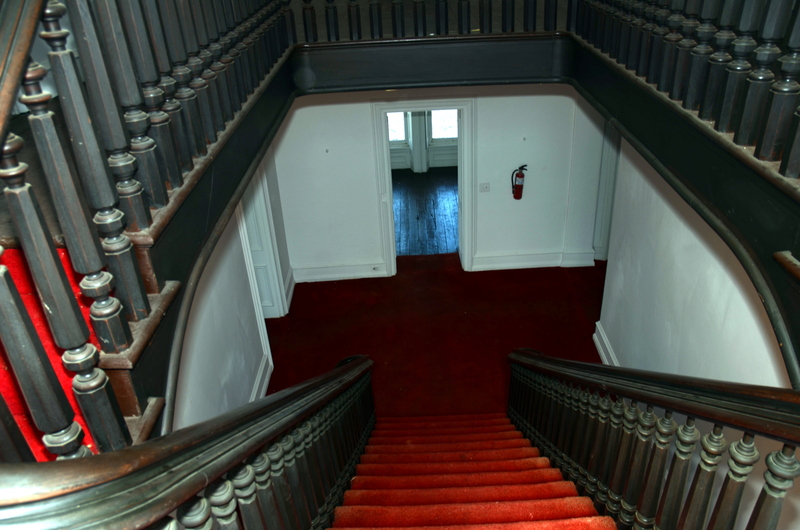 It was restored and converted to a handful of luxury condominiums. 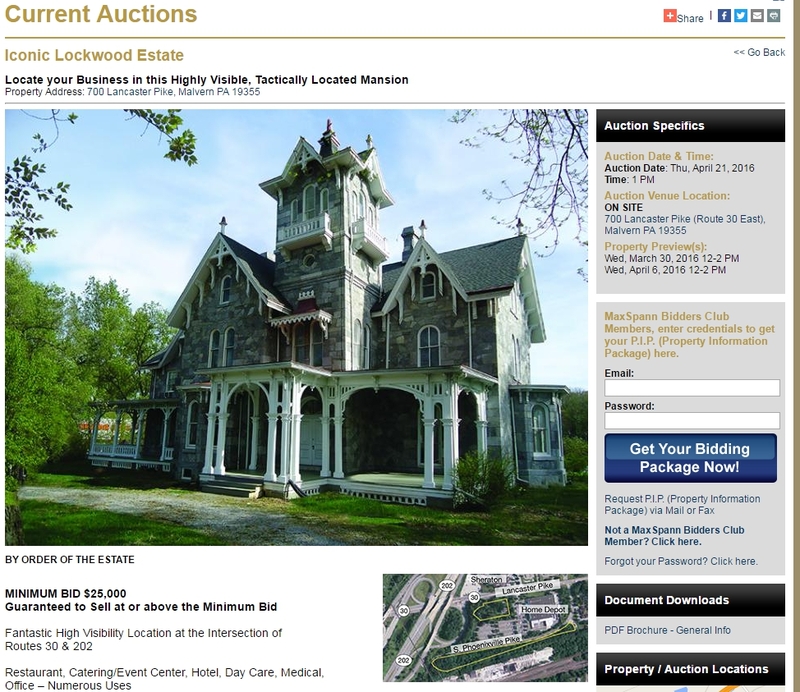 Follow THIS LINK TO GET LOCH AERIE/ LOCKWOOD MANSION AUCTION INFORMATION. There is one more property preview next Wednesday April 6th, 2016 from 12 pm to 2 pm. 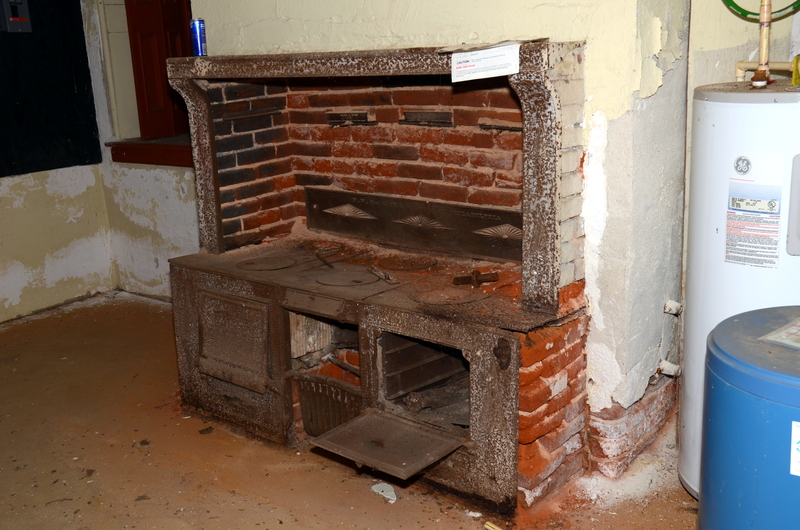 It was done for The Historic American Buildings Survey Heritage Conservation and Recreation Service Department of the Interior Washington, D.C.
adjoining the original tract at different times and from 136 acres it has increased to 680 acres. paper collars and folding boxes, and lost much of it promoting local railroads. The house remains with few changes. The fine landscape was designed by landscape architect Charles P. Miller. 1874 at an expense of $8000. A fine parsonage will be erected during the coming summer. Wm. E. Lockwood, of Glenlock, has a telephone in his house also one in the P.R.R. tower so that in case of invasion of his domicile by burglars or tramps he can call the P.R.R. hands to his assistance. 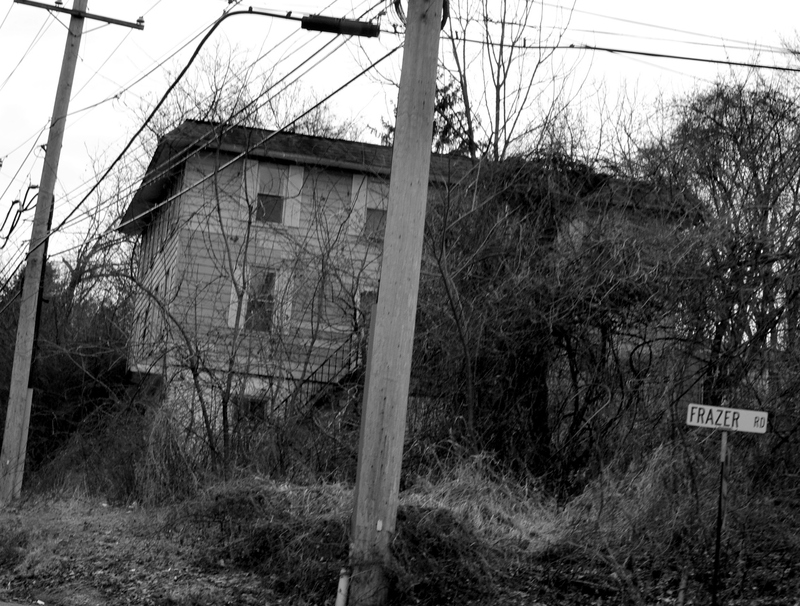 The Railroad Company also keep a police car on the siding there to lock up all loafers and tramps found in the vicinity. Mr. Lockwood also has a very complete “burglar. alarm»”which connects with every door and window in his house, and borrows his neighbors “bull dogs” for outside alarm at night. Also he has a formidable array of repeating revolving and breech-loading pistols and rifles and we understand he thinks of adding a gattling gun and jackass howitzer, and yet he retires to his little bed very uneasy as to his safety during the night. 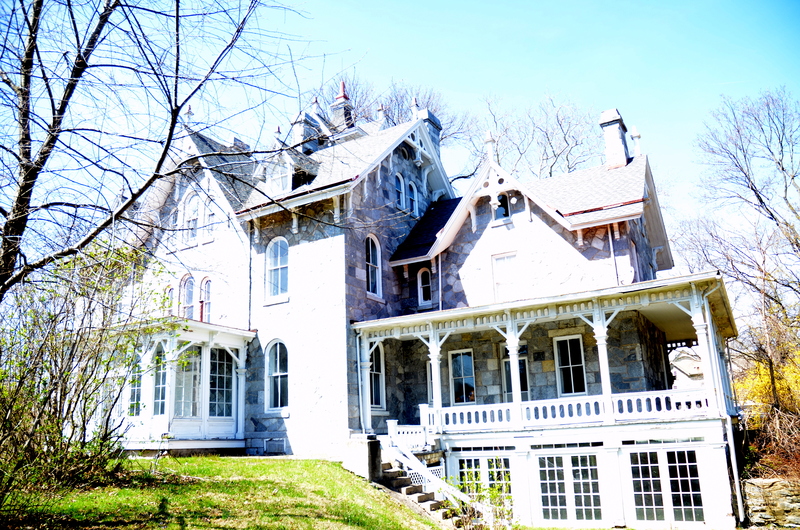 One of the most interesting houses in the Chester Valley is that of the late William E. Lockwood, at Glen Loch. It was built in the year 1865, with its towers and bull’s-eye windows. William A. Stephenson, late of West Bernard street, West Chester, was the boss stone mason, and the walls were well built. The architect was Addison Hutton, who, five years later, designed the first building for what is now State Teachers College. Mr. Hutton, as the story goes, was on his way to Glen Loch in response to a summons from Mr. Lockwood to consult with him in regard to the plans, when he was told that Abraham Lincoln, President of the United States, had been shot. treasures in the home today is a painting of George Washington on horseback – a handsome piece of work which once was loaned to the late John Wanamaker, long ago, to be exhibited in his Market street window. 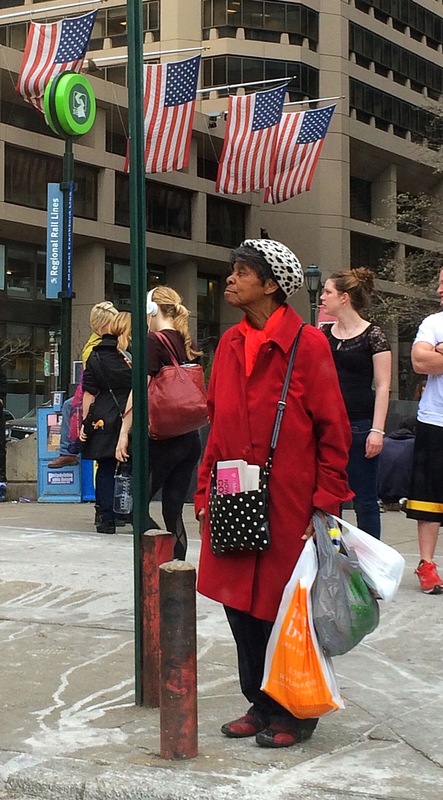 People, we need to save the grande dame. #ThisPlaceMatters and she needs a preservation/adaptive reuse buyer. 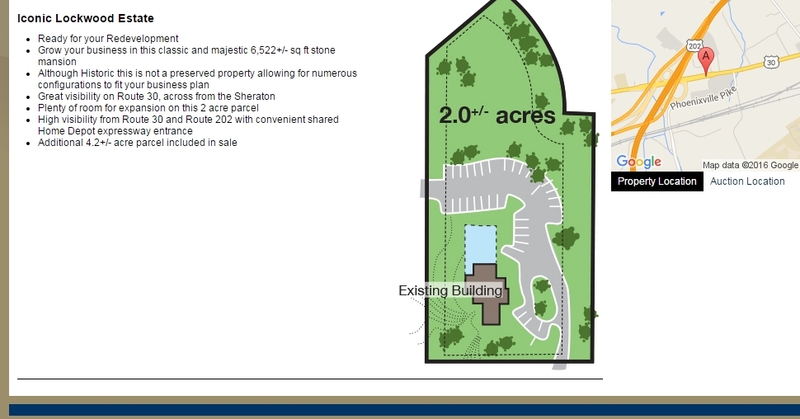 Not just some developer who wants the other 4 acre parcel that goes with the house and the 2 acres it sits on. Loch Aerie has so much potential still. I can totally see a boutique hotel with a marvelous little restaurant on the first floor. 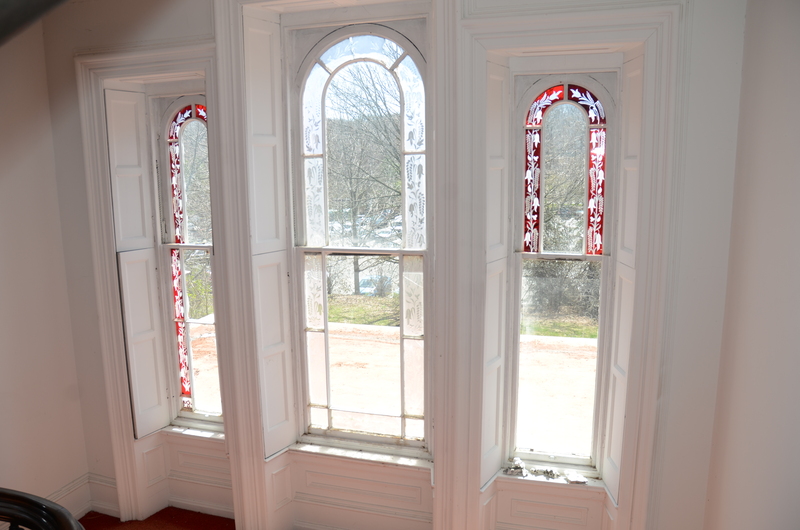 loch aerie/lockwood mansion in frazer up for auction in april. will it be a goner? Does anyone care what happens to Loch Aerie? I was alerted to this today and couldn’t believe it, but it’s true! Max Spann Auctions are selling the old gal off April 21st in an auction. I am so sad. East Whiteland always seems to want to seek it’s own identity as a community but here we go again – one of the other most iconic structures, Loch Aerie is seriously at risk. Do you really think anyone preservation minded will step up in the 11th hour? It is a nice thought but folks like the ones saving the iconic Farmers and Mechanic Building in West Chester are few and far between. 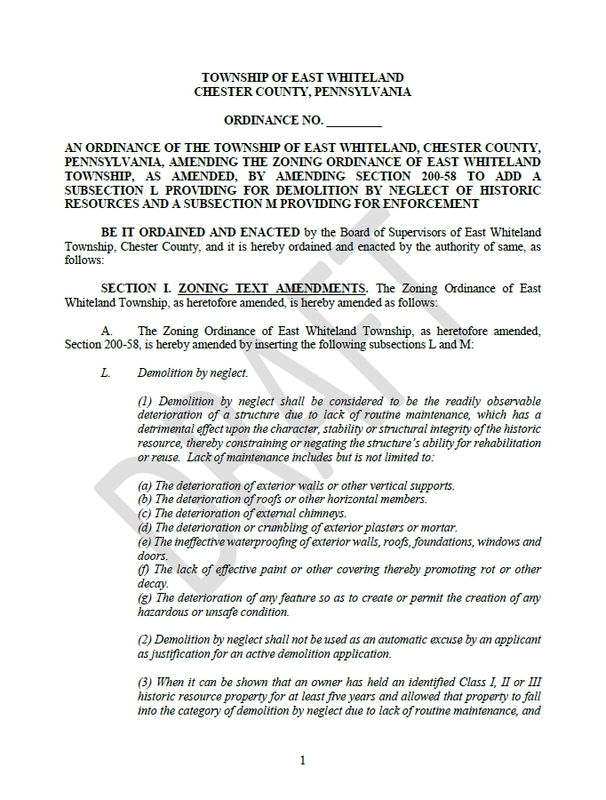 East Whiteland, are you ever going to wake the heck up and save part of the history that surrounds us? Is everything supposed to become a strip mall or housing development or office park? The ordinance is ONLY a start. A 5 year period of no building permit as part of enforcement would be better than one year. One year is a “blink” in development. You are absolutely right- a monetary fine is useless. The supervisors need to recognize the urgency of this ordinance or it will be too little too late as usual. Thanks for staying on this story! But what good is staying on a story no one seems to be paying attention to? I hear the new supervisors are all into affordable housing but the joke of it is none of the approved, planned, being built, and yet to be built living units are truly affordable housing are they? People are snide and say East Whiteland’s idea of affordable housing are trailer parks, but other that the William Henry Apartments and the trailer parks, what is actually something that even falls into the category of affordable housing that is being proposed? HOW ABOUT SOME ACTUAL HISTORIC PRESERVATION? Never mind. Everything has a high price tag and none of it seems to include conservation buying or active historic preservation. That screen shot was taken a few minutes ago. What do you see? NADA. Nothing. Zilch. I really hope someone will step in and save Loch Aerie. Realistically (again) I just don’t see it happening. But cheer up, someone will build some more “carriage homes” or “luxury singles” somewhere. 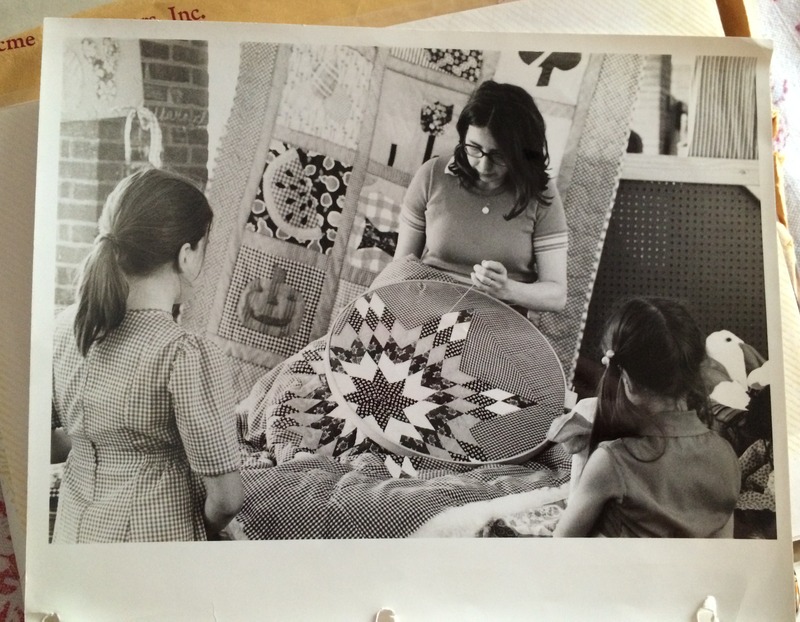 1974 taken by ACME Newspapers (a/k/a The Main Line Times) – Head House Crafts Fair Society Hill- and yes even then I loved the art of quilting. We actually still lived in Society Hill at that point so I am not quite sure how I ended up in a photo for a suburban paper. Growing up on the Main Line there are just things you grow up with. Namely the local society pages. Historically, sometimes what has kept a local paper afloat wasn’t necessarily local news, but the society pages. It was like a rite of passage: you go to nice private schools, you have nice Main Line parents who do their share of volunteer work and from the time you are little you get your photo taken occasionally. My friends and I had it drummed into our heads that society editors were to be respected and revered. You always were polite and you never asked to be in a photo, you were invited to be in a photo. 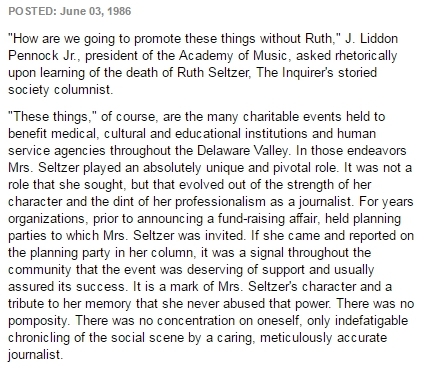 When I was little, the queen of the society editors was Ruth Seltzer from the Philadelphia Inquirer. She was formidable to say the least. She was a society editor first in the original Bulletin and then Walter Annenberg lured her to the Philadelphia Inquirer, where she remained until her death in 1986. Ruth was the high bar that the other society editors had to reach to meet. My mother knew Ruth and I remember in her later years my parents giving her rides home from social events on their way home. Her society columns were just that columns with maybe a photo or two. Not like today which are mostly photos with captions. You would read the columns and she would have descriptions of parties and who was wearing what and maybe a photo or two. She was an encyclopedia of who was who in the Philadelphia area. It was always a huge deal to make it into a Ruth Seltzer column. But you didn’t ask to be, she decided. She was a force of nature. A lot of people didn’t care for her. I was still kind of young when she died, early 20s. I loved reading her columns. 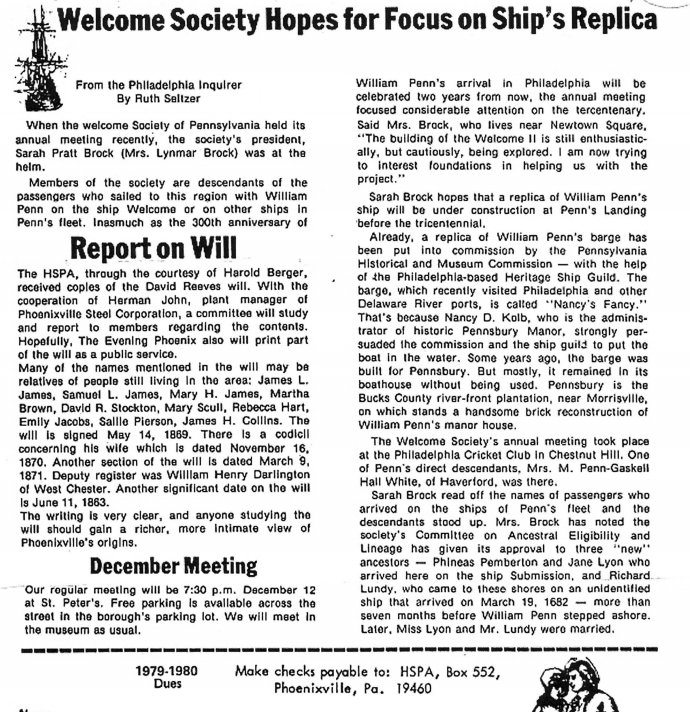 Ruth Seltzer was such an institution that you would find her mentioned in books about Philadelphia and her columns re-quoted in various newsletters. I remember when someone I knew’s father wrote his autobiography he wrote about Ruth Seltzer when recounting a tale of when he first came to Philadelphia. At other papers, namely the suburban weeklies for the most part there was a certain jockeying for position after Ruth Seltzer died. One now deceased society editor in particular thought her ascension to the top would occur after Ruth died. It didn’t happen. She never got over it and grew increasingly more miserable and mean spirited. So enter this new era: all these society editors from other papers jockeying for position and readership. If one took your photo, another one wouldn’t. Or you could play a game and see if you can outwit them. I will admit that some of my friends and I had an enormous amount of fun seeing if we could get more than one society editor to take our photo at the same event. But we never asked to be in photos. We were invited to be in photos. You see a couple of these society page folks in particular so did not get along that they would often appear at events to cover them at different times so their paths did not cross.And that would make chairs of non-profit events more comfortable anyway since a couple of these other society editors expected exclusives. I did my volunteerism thing fairly devotedly as I was expected to up until 9/11. After 9/11 I decided the world had changed enough that I wanted to still be active in my community, but the bloom was off the rose for the countless black tie events. And people and the events were changing too. It just wasn’t as much fun. It used to be that black tie events were exclusive. You got dressed up and you felt special. All of a sudden there were what felt like thousands of them. And the people were changing. It became less of a who’s who and more of a who was buying a corporate table. I noticed that first at Opening Night of the Philadelphia Orchestra. All of a sudden there was this super emphasis on corporate tables and they were filled by people who really didn’t know or appreciate the Philadelphia Orchestra but their company bought tables, so they got dressed up and went. Society and what defines society has completely changed. Slowly from the late 1980s on you saw a shift. No longer was it the norm to be asked to be in a society photo, you told the society editor whom to photograph. And if that didn’t work, you just hip checked someone out of the photo quite literally so you could be in it. That actually happened to me at a black tie that the old Chester County SPCA used to hold called the “Growl Scratch and Sniff” (yes that was the name of the party and it was a lot of fun!). Anyway, this woman wanted to be in a photo and some of my friends and I had been asked to be in a photo and we literally got hip checked out of the photo. I remember just moving off to the side and kind of just standing there a minute because I could not believe someone had done that. Today at the rare occasions I am at one of these things any longer the water buffalo-like jockeying for position and “take my photo” is somewhat astounding to observe. As what defined society changed, so did the newspapers. Newspapers had also started consolidating and even closing as the Internet and how it was used grew. On the Main Line for a while there were three papers with society editors: Main Line Life, Main Line Times, Wayne and Suburban. There was also a City Line paper that no one ever wanted to be in. Then on the other side of the river was the Chestnut Hill Local. And other even smaller papers sprinkled everywhere. When the Main Line papers consolidated it became like the Hatfields and the McCoys with the two remaining society editors. Then they got rid of one and eventually the other one died. Which brings us to today. You have a really nice man who does most of the Philadelphia area events and a smattering of surviving society editor folks. Main Line Media News still has a very nice lady who does what is left of the “society” pages, and there are others, including a former Main Line area society editor who does photos for her own website. Only when you run into that one these days she is not as pleasant. Fairly unpleasant as a matter of fact. And that is even when you are just saying hello for old times sake, and have absolutely no desire to be in a photo. Truly, it is very sad. Some ladies I know whom are slightly older than myself say that something must happen to these women who survive at this now somewhat archaic tradition of the society page. I have had more than one say to me how miserable a lot of them get, even while they are still on the job. 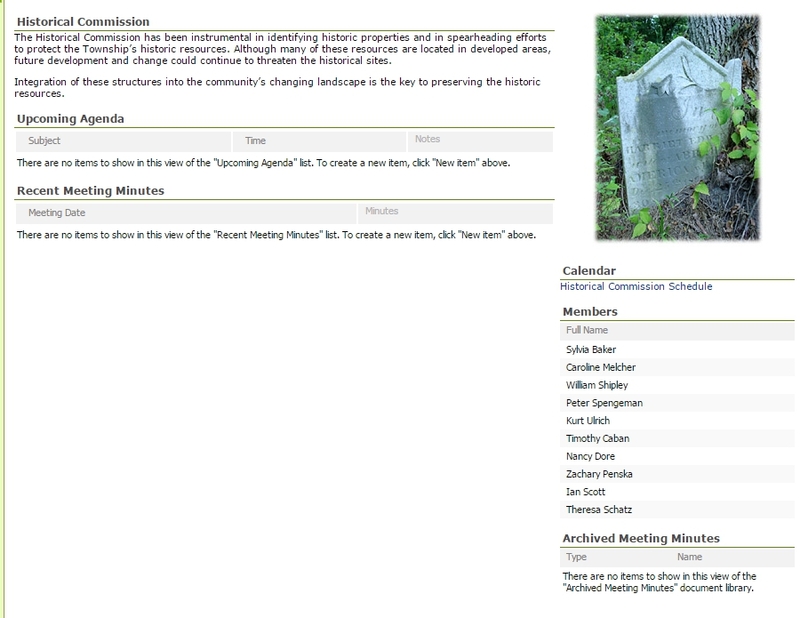 I look at the society pages now and I marvel at how I no longer recognize any names. In the good old days you recognized the mothers, the daughters, the grandmothers and so on. It was a tradition after a fashion.I also remember I loved to look at the photos because I loved to look at the gowns. Today? Not so much. And it is not just that there are different people in the photos that you wonder who the heck they are, but more often than not the event is not dressy and you look at the photos and wonder why they wore that not wow what a gorgeous dress. That and people no longer seem to really know how to stand for those photos, or arrange themselves so the photos flow. Anyway, this is just something that has been rattling around in my head: what passes for high society today? Should we care? 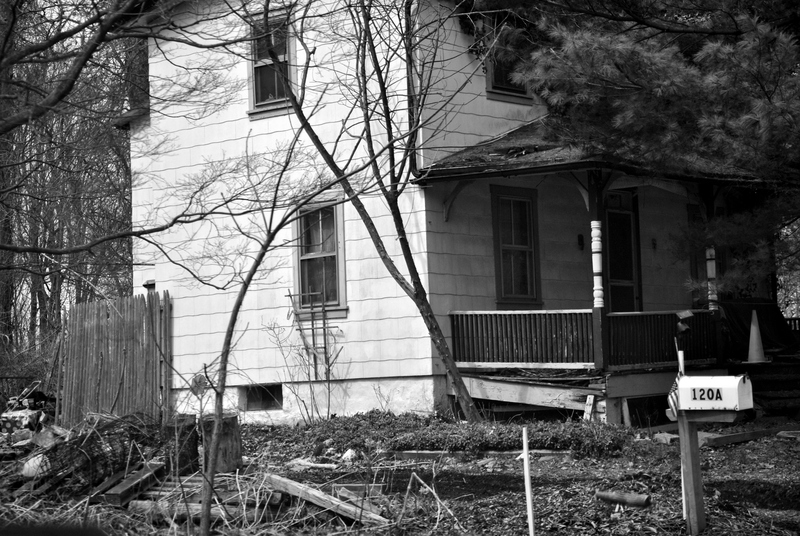 The problem with a Demolition by Neglect Ordinance is what does it actually save? It’s not like whatever fines they impose will be extraordinarily punitive to a developer, will it? Two examples of active demolition by neglect in my opinion are Linden Hall or the historic house rotting next to Clews and Strawbridge . What would be being charged with demolition by neglect actually do except possibly be considered by a developer to be a “cost of doing business”? How would this proposed ordinance affect homeowners or renters who might not have any financial choice in how the property looks? Or what about abandoned factory sites like Bishop Tube? While it is pending whatever happens it is crumbling and rotting away. There are photos on the Internet going back to 2010 that are interior shots. 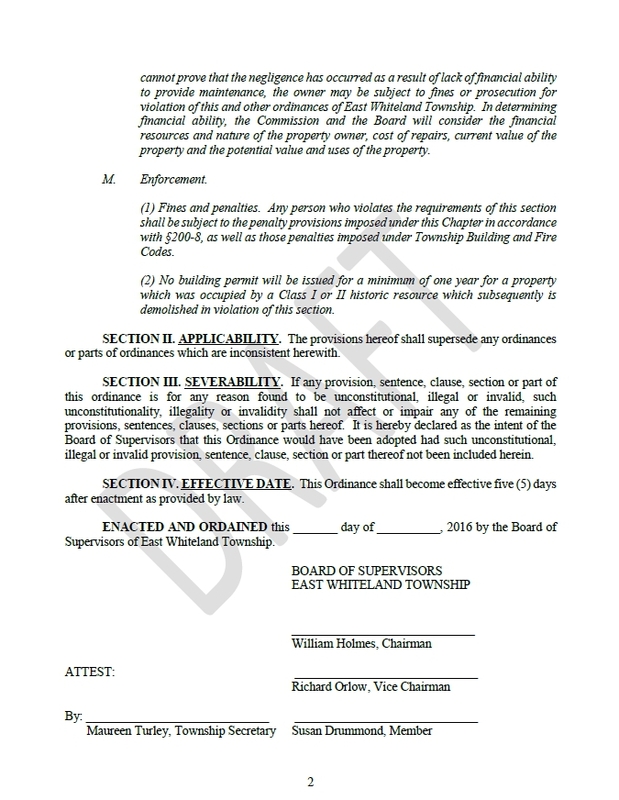 Shouldn’t an ordinance like this also be able to encompass properties like that? After all they are also demolition by neglect pending redevelopment of the property, only it’s not historic except for the chemicals present like TCE. I am not against a Demolition by Neglect Ordinance. I just wonder if it will be punitive towards those who truly deserve it? And it is not just developers who let historic properties rot. 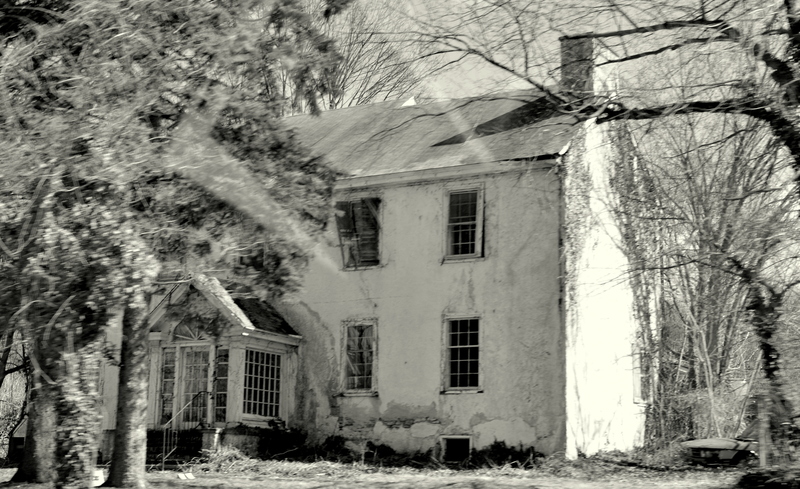 And it’s not just historic properties which suffer from demolition by neglect. 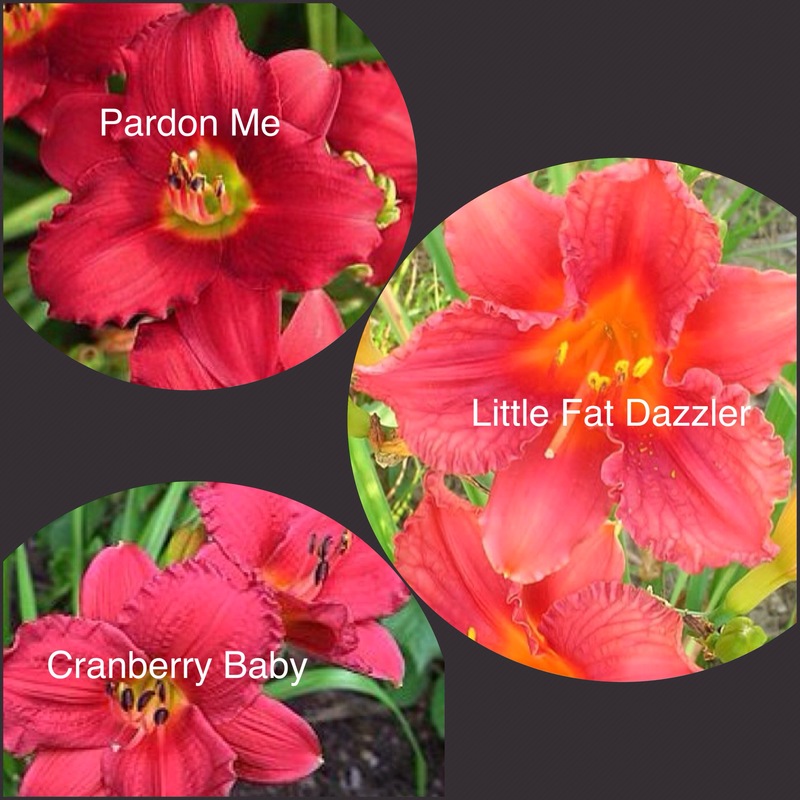 Above are three cultivars of daylilies that I am adding this season. Cranberry Baby is a little re-blooming daylily that is going into pots with the small hostas pictured in below photo. 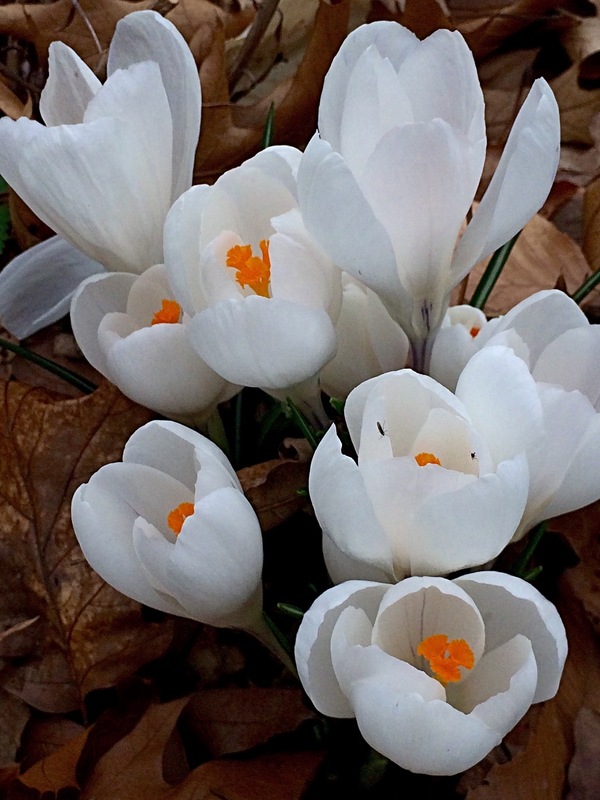 It’s simple: I have a lot of garden to care for so I am trying to simplify where I can. I have decided that pots that can remain out year round are getting planted with perennials mostly. That way I have consistency and don’t have to plan out these pots every year, they are done. 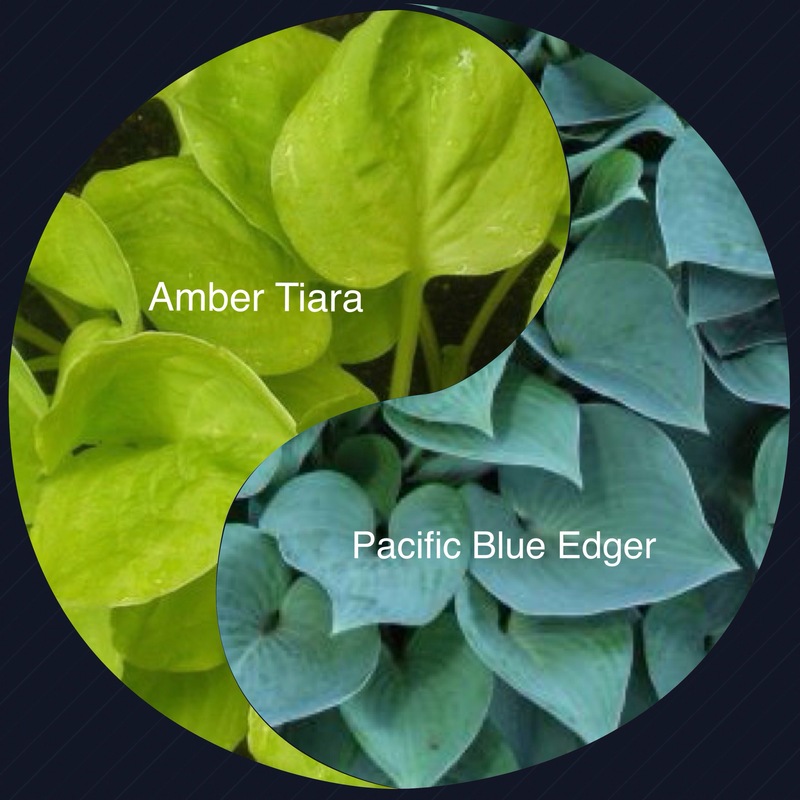 I will have to refresh the soil and possibly split the perennials, but their design will be set. My garden seems to have come through the odd winter ok, and I will be planting onions and shallots in with my perennials and roses in the garden beds. I will use them in cooking as they grow, but they also are a deterrent of certain pests like aphids.